West Windsor residents have plenty of ideas about how to make our community friendlier for bicyclists and pedestrians. The WWBPA collected more than two dozen suggestions at its annual meeting, ranging from more education in the schools, including in drivers education classes, about the rights of bicyclists and pedestrians on our roadways to pairing up with West Windsor Little League on a joint bike promotion to a long-term project of creating better pedestrian and bicycle access to Plainsboro and Princeton. See the complete list here. Prior to the meeting, we heard from a resident who wants to work on ways to encourage motorists to slow down and from another who has asked the mayor to add traffic lights on Canal Pointe Boulevard so pedestrians can get to MarketFair and to and from the bus stop. Residents also are concerned about Route 571/Princeton-Hightstown Road. The need for improved safety there became more apparent after a pedestrian crossing Route 571 with the light was struck by a motorist making a right turn from Wallace Road. New Jersey Department of Transportation is making a number of improvements to the intersection of Route 571, Wallace Road and Cranbury Road this spring. Click here for more about what’s happening on this key roadway. The next step is to figure out how to best turn these ideas into reality. The WWBPA’s all-volunteer trustees can’t do it alone. Put your hand up to help with your favorite idea. Come to any monthly meeting or e-mail wwbikeped@gmail.com. Celebrate the Start of the Farmers’ Market Join the WWBPA in marking the reopening of the West Windsor Community Farmers’ Market with a light walk from the playground behind Maurice Hawk Elementary School to the market on Vaughn Drive. The walk starts at 10 a.m. (arrive a bit early), and the return walk (for those who would like to) starts at noon. Total distance is less than three miles, which will fly by as you chat with old friends and make new ones.The WWBPA will have some fun giveaways for walkers at the market. Watch our Facebook page and wwbpa.org for updates. Once again, the WWPA is accepting applications from high school seniors in the West Windsor-Plainsboro school district or who live in West Windsor. Up to $1,000 in scholarship money (no more than $500 to one student) is available. 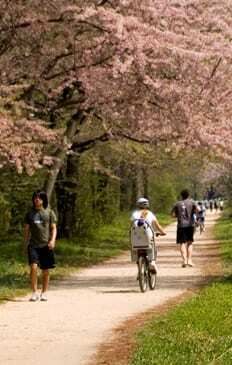 Applicants are required to write a short essay on a topic relating to bicycle and pedestrian safety. The deadline is May 2. For more information, click here. Join the WWBPA’a annual mileage challenge: Tell us how many miles you cycled to work or to run errands and we’ll report back weekly. Toss in a photo for good measure so we can spotlight you on wwbpa.org and our Facebook page. E-mail your mileage log weekly to wwbikeped@gmail.com. Last year, members and friends reported riding 2,466 miles in the month, more than 1,000 more than in May 2009. To mark National Bike Week (May 17-21), the WWBPA and its partners will host a ribbon-cutting ceremony for additional bike racks and lockers at the Princeton Junction train station at 8:30 a.m. on May 18. This project, which involves three sites at the station, has been a combined effort of the WWBPA, Greater Mercer Transportation Management Association (GMTMA), BikeFest, West Windsor Parking Authority, New Jersey Transit, and West Windsor’s Public Works Department. The ceremony will take place between the Trenton-bound tracks and the Dinky. GMTMA will host a (grab and go) bikers’ breakfast there from 6:30 a.m. to 8:30 a.m.
Come to our monthly meetings, held on the second Thursday of every month at the West Windsor Municipal Center. Meetings now start at 7 p.m.
We’re at the West Windsor Community Farmers’ Market every other Saturday beginning May 1. (On May 29, we’ll be at BikeFest). 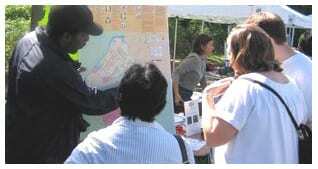 Come talk to us about where to walk and bike or to get safety tips and equipment. We will be collecting bicycles for the Boys & Girls Club Bike Exchange, which supports the after-school programs of the Trenton Boys & Girls Club, at the Farmers’ Market on June 12. We also will be at the bike collection of Princeton United Methodist Church on Vandeventer Avenue in Princeton, also benefiting Bike Exchange, on May 8. Want a speaker for your local organization? E-mail us at wwbikeped@gmail.com. Follow us on the Web at wwbpa.org, on Facebook and on Twitter. Or e-mail us at wwbikeped@gmail.com. Keep our newsletter out of your spam box; add our e-mail to your address book.